April 22 2011 – The 2011 NFL Rookie Draft just under a week away. There are millions of American Football fans around the world hoping and praying their team drafts the next Tom Brady, Barry Sanders or Lawrence Taylor. With the current NFL lockout in effect denying teams from making any free agency moves or draft day trades involving veteran players, the 2011 NFL Draft is the first meaningful football action since Ben Roethlisberger failed to ignite a last-minute scoring drive in Super Bowl XLV. From the United States to the United Kindgom fantasy NFL fans will be either preparing for separate Rookie drafts or looking to get one up on their league rivals when they draft 2011 fantasy teams. All fans will want to know who will be worth selecting in the top three, who will be a quality mid-round contributor or who will go undrafted by NFL teams but have a shot at being a difference maker (like Arian Foster or Legarrete Blount). One man, based in Athens, Georgia, has made it his personal crusade to help all NFL fantasy football fans across the globe to have the best quality information about College offensive skills players, so you can make informed draft choices, safe in the knowledge that you know if your player is a Paper Lion or a True Tiger. 41 year old Tennessee Titans fan, cat owner and admirer of Dutch Gouda cheese Matt Waldman has spent the last year tucked away in a converted one car garage watching an insane 60 to 100 hours of film a week to produce the ‘2011 Rookie Scouting Portfolio’ or the ‘2011 RSP’ as those in the know will affectionately call it. The PDF document, now in its sixth year of publishing, is a mind-blowing 859 pages of analysis of 160 College Football athletes, covering the best QB, RB, WR and TE that will be looking to be drafted next week. NFL fan in England editor Lawrence Vos spoke to Matt on 17 April 2011 about the RSP and a lot more besides. Lawrence Vos (LV): Where did the idea for the Rookie Scouting Portfolio (RSP) Come from? Matt Waldman (MW): The idea came from a combination of things, my desire to learn about NFL prospects, figure out a way to systematically learn more about the game, and my previous career as an operations manager and quality assurance director for a company with 50 call centers nationwide. I was certified in an operations process for call centers that borrowed statistical quality methods from other industries (Deming, ISO, etc.). My job was to use these principles to create a grading system and database for monitoring the performance of employees interacting with customers. I decided to apply this approach to evaluating football players. LV: Can you describe how you grade players? MW: The basic principle of the RSP is the use of two grading methods. One is a quantitative grading tool, which is the position-specific checklist. It’s a long report card of skills and attributes that are defined in writing to develop a clear set of guidelines for evaluation. Each evaluation question is scored Yes/No and I weight each question with a point value. The checklist is designed to determine how many of the basic skills and fundamentals a player has at this stage of his game. I read my share of coaching manuals, and take note of what former and current NFL players and scouts say on television, radio, or in print about techniques involved with each of the positions I study. I continue to seek this knowledge to develop and refine my written guidelines. The second grading method is qualitative in nature. I take detailed play-by-play notes in the database that explains why the player earned each score on the checklist. This information not only shows whether a player performed each skill to the baseline expectation, but it also reveals HOW skilled the player is. For instance, Peyton Manning has an NFL arm, but it’s not on the same level as Brett Favre’s. The note taking of the play-by-play examples gives me information to evaluate these players on several levels. And the great thing about this method is that its architecture is designed to improve the performance of the evaluator. The more you strive to sharpen your scoring criteria and guidelines, the more incisive the evaluations become. It helps me continuously refine my skills. LV: So when did preparations begin for the 2011 RSP? MW: Preparation began last May (2010), but the work involved wasn’t film study. After five years of evaluating players I felt it was time to take what I learned and revamp the analysis tools that I use to structure and compile all of my film study. This involved re-writing and re-scoring the criteria that I use on my checklists and then creating a new database. This took about three months. Film study began in September, but the bulk of the work occurred between November and March. I watch at least 60 hours a week of film during this time – sometimes as much as 100 hours a week. I’ve already begun my film study for the 2012 Rookie Scouting Portfolio. LV: Where do you get all the game footage from? MW: I just use a DVR to record as many games as possible. It’s constantly recording from late August through mid-January. While it would be nice to have coach’s tape, which provides a specific perspective to see the entire field at all times, I would be among the minority to argue that for certain positions, such as wide receiver, it’s simply not as great of a resource as it’s cut out to be. Network broadcasts often provide closeups on a receiver’s initial release or his technique with breaks that you can’t see with coach’s tape. I’d also say that watching a volume of plays in addition for having a defined idea of what you’re really evaluating is most important. LV: For the benefit of readers can you describe the ‘bat cave’ where you spend your working week? MW: My ‘bat cave’ used to be a one-car garage that I renovated into my home office. The garage door has been replaced with a bay window with a window seat. Along the outside wall is a couch, a tall floor lamp, a stereo with stacks of cassette tapes of jazz albums I’m slowly converting to CD and the bicycle I use to ride to the day job. Along the inside wall are two, eight-foot-tall wooden book shelves I got for free from a guy who makes his living selling used furniture and refurbished electronics on eBay. The shelves hold mostly novels, poetry, and jazz LPs, They book-end a large mahogany desk that was handmade for me as a gift while I was living in Jamaica. On that desk is a medium-sized TV that’s probably 12-15 years old that I bought from a pawn shop in 2004, a DVR, large stacks of DVDs, and my PC. I use a database to do my evaluations so I’m at my desk watching, rewinding, using slow-motion playback, and then pausing to type what see into the database. Generally there’s one of a few cats vying for a spot in front of the DVR that the PC monitor sits on. LV: Right on! So lets get down to some brass tacks. The Carolina Panthers have the ‘honour’ of picking first in the 2011 NFL Draft. If you were the Panthers GM which direction would you be heading? MW: I’d have Marcell Dareus, A.J. Green, Von Miller, and Blaine Gabbert on my short list. However, I would consider trading down because there’s some very strong evidence (from the book Scorecasting) that shows the NFL vastly overvalues high first-round picks. The short explanation is that the league copied the draft value chart that former Cowboys minority owner Mike McCoy devised and the team used with tremendous success during the Jimmy Johnson era. The chart was successful for the Cowboys because no other team had a clue about valuing draft picks. However, McCoy admitted that the chart was a rough calculation of values and as a result teams were copying faulty data that has become an entrenched fallacy in the league: teams are overpaying for top draft picks. Great examples include: the Falcons-Chargers trade where the Falcons got Mike Vick and the Chargers used those picks to select Drew Brees and Ladainian Tomlinson; the Giants getting Eli Manning and the Chargers getting picks that equated to Eli Manning and Shawn Merriman; and the success of the Philadelphia Eagles and New England Patriots trading down in the draft to stockpile picks. If I were the Panthers GM, I would consider trading down 5-7 spots, and either take whichever one of these players were available able to me, or continue trading down until I could get a player in the middle of the first round with equal talent and more room to pick. If forced to pick from this group, I’d understand the logic of taking a defensive tackle and build the team team inside-out, but I’d take the less conventional route and go with A.J. Green. The Panthers defense needs work, but there’s enough talent there to suggest that the unit would have been significantly more effective if the team had a more effective offense. If your defense is on the field too often, most NFL offenses are going to exploit it with enough chances. Carolina has the components for a strong ground game, but they need a receiver that can take pressure off Steve Smith. I’d rather add a receiver who cannot only help Steve Smith see more single coverage, but who can also develop into a player who can take over Smith’s role in a few years. Then I’d either pursue a free agent quarterback or trade for a player like Brian Hoyer of the Patriots, if a player like Christian Ponder doesn’t drop to the second round. There’s always talk about adding a quarterback first and then receivers, but I think I’d rather get the receivers and add a quarterback. Marvin Harrison was taken a year before Peyton Manning. 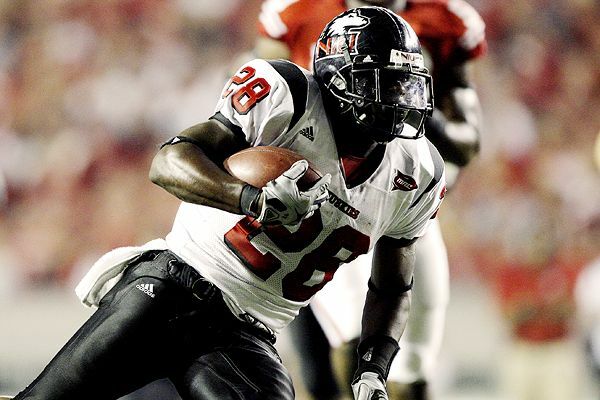 Roddy White was taken a few years before Matt Ryan, and Calvin Johnson was taken prior to Matt Stafford’s selection. I think if Carolina adds another receiver, it unshackles the offense enough to make life easier for even its young crew of developing quarterbacks and becomes more of a draw for a free agent signal caller who can make this team a winner. If the team fails to improve this year, there’s always Andrew luck in 2012. MW: Gabbert earned the slight edge because his talents project well to any offensive system. Ponder might actually be more prepared for the pro game, but he’s probably best-suited for a variant of the west coast offense – a system predicated on short passing and the play action game. Gabbert has the better arm and equally good, if not better mobility to develop into a good passer in any systems. LV: Much like Tebowmania in 2010 it’s Newtonmania in 2011. What does your crystal ball have in store for the National Champion quarterback? Can answer using the most suitable food based analogy please. MW: I think NFL teams get way too starry-eyed over athleticism. In my opinion, great athleticism is the gravy, but the meat (passing skills and conceptual understanding of the position) is the most important thing. The gravy might initially disguise the taste of poorly prepared meat, but eventually you’re going to regret the choice to consume that dish. Newton will be a first-round pick, but I believe he’s not ready for the NFL as a passer. He’s a talented, but raw quarterback who can develop into a Steve McNair-type of player if a team is patient enough to let him work behind the scenes of a veteran for 2-3 seasons. This isn’t likely to happen, so I do expect him to face a steep learning curve where the average fan experience the roller coaster of emotions that will come with Newton’s development. LV: Which quarterback do you think will represent the best value from where he will be drafted? And which qb that will be drafted do you think will be Dolly Parton (big bust)? MW: I think three quarterbacks have a good shot to become excellent values five years from now: Louisville’s Adam Froman, Alabama’s Greg McElroy and Iowa’s Ricky Stanzi. All three possess the potential to become excellent NFL pocket passers. McElroy is the savviest of the three, but has perhaps the least athletic upside in terms of arm strength and mobility. However, he’s extremely smart, tough, and aggressive in the conceptual aspects of the position. Stanzi has all of the tools to become a starter, but right now he tends to play his best football in the first three quarters and he needs to develop more poise in the final quarter to put it all together. Froman has the most upside of the three. He’s a fine athlete who simply couldn’t stay healthy after transferring from a junior college. When he played, he demonstrated all the skills of a top-notch prospect. LV: Like you I love to unearth some small school guys in my rookie drafts. Can you describe a small school player in each of the offensive skills positions that could become a difference maker in the NFL (if not immediately in 2011)? MW: Northern Illinois RB Chad Spann is probably the most talented runner most people won’t know about. He might not even get drafted, but he’s a patient and tough runner with enough burst to develop into a solid committee back, if not a starter. He reminds me of Priest Holmes and Spann told me recently that his workout buddy, Bears receiver Johnny Knox, said the same about him the day before. Western Michigan WR Juan Nunez has the speed, hands, and toughness to develop into a quality player. His coach compared Nunez favorably to fellow alum Greg Jennings of the Green Bay Packers. Florida Atlantic University TE Rob Housler and Portland State’s Julius Thomas are both solid receivers with athletic upside to develop into productive move-tight ends. At quarterback, Delaware’s Pat Devlin is probably the most well-known small school QB, but I didn’t have the opportunity to study him to comment. However, University of Texas El Paso quarterback Trevor Vittatoe is a player that Mike Price said is the best passer he’s coached and that includes former Pro Bowl QB Drew Bledsoe. Vittatoe has an NFL-caliber arm, good mobility, and he’s tough. He played much of his senior year on four torn ligaments in his ankle and a separated non-throwing shoulder. LV: Who are some of the players who will for sure go undrafted but will have teams scrambling to sign them after draft weekend? MW: Juan Nunez and Chad Spann are players I mentioned earlier. There’s also Troy RB DuJuan Harris (a player with Maurice Jones-Drew’s build and stylistic tendencies), WRs Jeremy Ross of Cal, Keith Smith of Purdue, and Cameron Kenney of Oklahoma might go qualify here as well. LV: I was introduced to the RSP through the Football Guys.com The Audible podcast. How did you get involved and do you have any salacious gossip about your broadcast partners Sigmund Bloom and Cecil Lammey? MW: I worked at another site for several years where started my column The Gut Check. I competed and won my share of showcase leagues against fellow industry writers as well as wrote strategy articles for annual fantasy publications. Bloom and Lammey saw the RSP and began featuring me as an occasional guest on their show while I was still with the other site. I had always been a fan of Footballguys.com and decided to see if they were interested in having me work with them. They were very receptive and the rest is history. Bloom and Lammey are great co-workers, who are also terrific people and I’m lucky to consider them friends as well. As for salacious gossip? I heard Lammey was a body double in The Full Monty and Bloom was once an intelligence agent, but I can’t confirm either. LV: What would be your dream job? Or are you living the dream and just not getting paid what you deserve? MW: (Laughing) Glad you think I deserve payment for the work I do! Let’s say that I’m working towards living my dream. The work is part of the dream. Making it sustainable is another part of it. However if I were to live a dream that had no basis in reality, I’d be a jazz musician. LV: You made a deliberate decision to just cover offensive skill players. Why is that? MW: I felt it was best to initially keep my focus narrow. I believe that if you want to be excellent it’s best to do one thing and do it great. 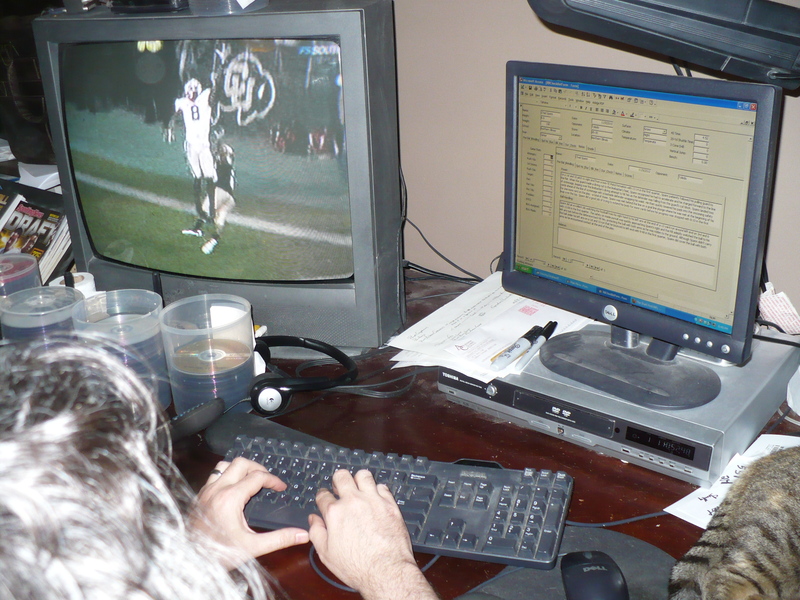 The initial purpose I had for creating the RSP was for fantasy football. I wanted to learn more about each incoming class of rookies for non-IDP leagues and I thought there could be a demand for material that focused solely on these players. However, I also realized very early that this information was also of interest to draftniks. In fact, scouts and former scouts-turned-major media analysts have been buying the publication. Unfortunately, my work is viewed as “the competition” at this point so the known media people aren’t people I can divulge – and trust me, I would like to name them – it would help what I’m trying to do. LV: If you could do a Santa Claus II and produce a replica model of yourself would you scout offensive linemen or defensive players? Or are you purely a lover of offensive skills positions? MW: I love the game of football so if I had the time, energy, and resources I would scout all positions. However, my process is so intensive that I would have to give up my full-time job as a writer at a university, the blogging I do for the New York Times Fifth Down Blog, and the work I do at Footballguys.com to do it right. LV: After watching thousands of hours of tape what were the top three crazy/jaw dropping plays that you witnessed? MW: I think watching two Stanford linemen get into a fight with each other when they were supposed to be pass protecting for their quarterback Trent Edwards has to be on the list. Larry Fitzgerald has two catches I saw that could qualify on this list – one in triple coverage over 40 yards down field when he was at Pittsburgh. There are so many great plays that they tend to blur together. I’d say three that stand out this year were two by Georgia WR A.J. Green and one by Louisville RB Bilal Powell. Green caught a corner fade against Colorado CB Jimmy Smith, a top prospect, in press coverage where he did a fine job of beating the jam and making a leaping one-handed grab over the top of the CB in the back corner of the end zone. The next week against Tennessee, he caught a deep post knowing he had to veer into the oncoming safety to catch the football. Green not only make a terrific over the shoulder grab, but he took a vicious shot to the chest and as he was falling he still had the presence of mind to secure the football after the collision jarred it loose. Powell had an 85-yard run against Cincinnati this year that was an off tackle play where he broke seven tackles in the first 15 yards of the play and then still had the stamina and speed to outrun the CB after he got 50 yards down field. Other than Marshawn Lynch’s playoff run, it was the best attempt I saw all year. LV: Thankyou very very much for your time Matt. Most importantly how do my readers get hold of the 2011 RSP for themselves? MW: The Rookie Scouting Portfolio, is an 859-page analysis of 160 players at the skill positions of QB, RB, TE, and WR. Now in its sixth year of publication, the RSP has positional rankings and analysis supported by extensive play-by-play, film analysis for every player. My process is unique among those who evaluate players and my takes are original, insightful, and supported with amazing detail. The New York Times Fifth Down Blog is posting daily excerpts from my 2011 RSP throughout April because of the kind of analysis I did for them last year. It’s available for $9.95 and you’ll receive a $3.00 coupon redeemable towards a 2011 Footballguys.com subscription. To download sample pages and get the whole shooting match click here.